It’s like Christmas all over again! As the East Hollywood hipsters and West Side bros pack up their bags for a debaucherous weekend at Coachella, you can all rejoice that weekend activities are much more enjoyable now here in our great city of Los Angeles. Get out there and treat yo’ self, LA style! 1. No line at your favorite coffee shop — You can now get an overpriced coffee and scone without waiting 20+ minutes! Since there’s now hardly any wait, you better take a quick Instagram photo of your shoes across that blue-patterned floor quickly. The line moves fast! 2. So much street parking! 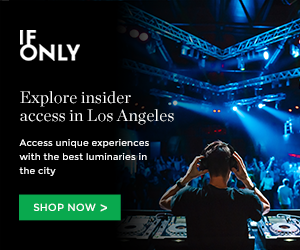 — With less cafe racers and Priuses taking up space along Sunset Blvd and all its side streets, you won’t have to spend 15 minutes or more looking for parking just to park close to your Echo Park cottage or to go to your favorite vegan restaurant. 3. No early a.m. scouting for a picnic spot — Silver Lake Meadow and Echo Park Lake will be nice and empty this sunny weekend. You know what that means! You can roll in at 1 p.m. fresh from your Davey Wayne’s hangover and still find a primo spot under a tree. Don’t forget that ‘vintage’ picnic basket now. 4. You’ll find a prime spot at El Matador beach in Malibu — With everyone at Coachella, traffic to Malibu this weekend should be a breeze! You can finally geo-tag your scenic photos so everyone knows you were at Matador Beach where all the models and hipsters go. 5. You will always find a seat at El Prado — You can totally hit El Prado before or after your show at the Echo and not have to cringe at the idea of not finding a seat and being bumped by every oversized brimmed hat in that narrow space. Rest assured, you can now comfortably have your beer and wine while listening to vinyl this weekend at El Prado. 6. You won’t have to wait in a massive line at Sqirl. — L.A.’s favorite hipster breakfast / brunch destination will be near empty this weekend! So get your “burnt brioche toast with house ricotta and jam” on, sans the wait! 7. You can venture to the West or East Side — It’s probably been a year or so since you last visited that buddy that lives in Venice Beach (I know… so far!). Despite being about 17 miles away, ain’t no in hell you’re leaving your East Side bubble for an hour + car ride to Venice. But, now you can! Bonus: if you live on the West Side you can actually swoop on over to the East Side since all the annoying hipsters will be away for the weekend (at Coachella or at Venice Beach). 8. The juice cleanse is done — Your favorite juicery will always have all the ingredients to make your favorite green juice. Now that all the L.A. girls have completed their Coachella juice cleanse, you can enjoy your juice with all the sprouts and macca your little heart desires. 9. Roll up late to a venue and still get in! — If you’re running late to the Echo or the Satellite after your shift at that new dinner speakeasy — don’t worry — tickets will not be sold out and you’ll probably get a pretty good spot up front. Everyone is at Coachella, remember! 10. Go on a hike — Since Southern California has finally received some proper rain this year, everyone has been crazy about visiting our local waterfalls and wild flowers. Gear up and get your hike on! What’s your favorite thing about Los Angeles during Coachella weekend? Let us know your genuine or snide comment below. This entry was posted in coachella, Top Lists and tagged coachella, Grimy Goods, hipsters, Hollywood, los angeles on April 11, 2014 by Sandra Burciaga Olinger. My favorite thing to do during Coachella weekend, is be at Coachella! !